A shuttle service for people with temporary or permanent conditions that impact mobility, who need assistance travelling to areas of campus that can otherwise only be accessed by foot. The UBC Accessibility Shuttle launched in May 2018 as a pilot service to promote accessibility on UBC’s Point Grey campus. The shuttle is a free, shared ride service available only by reservation. It transports people with conditions that impact their mobility from designated stops to and from the central pedestrian areas of campus. The Accessibility Shuttle serves areas that can otherwise only be accessed by foot (i.e. areas with limited vehicle access and parking). 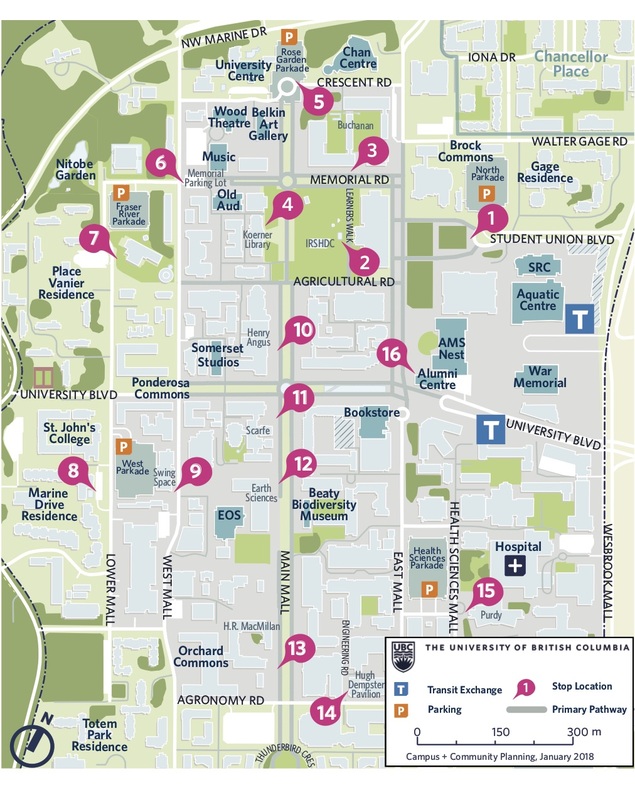 Each UBC building in the service area is within 100 meters of a shuttle stop. People are encouraged to use transit (including the UBC Community Shuttle) and UBC Parking to get to locations that fall outside the Accessibility Shuttle service area or to connect with the shuttle service. Who can use the shuttle? The UBC Accessibility Shuttle is available to all students, staff, faculty, residents, and visitors on the UBC Point Grey campus who have temporary or permanent conditions that impact mobility. When you book your ride, please be prepared with your pick up and drop off locations, dates and times. Please see the shuttle map for stop locations (at the bottom of this page). Each client is limited to 3 rides per day. You must book your ride ahead of time. Bookings are made on a first-come, first-served basis and are subject to availability. Wait time can be between 5 – 40 minutes, depending on volume. Book ahead to ensure more timely and reliable service. If you leave a voice message to book your trip, you will receive a call back to confirm your ride by 8pm the evening prior to your pick-up date. Look for shuttle signs at your stop location. This is where the shuttle will meet you. See the shuttle map for more details on where to go for your pick up. The UBC Accessibility Shuttle operates between 8:00am and 7:00pm, Monday to Friday, excluding statutory holidays. The UBC Accessibility Shuttle provides pick up and drop off at designated stops. Pick up locations for people arriving to campus are near the North, Fraser River, West, and Health Sciences parkades as well as near transit. Drop off locations are at designated stops within the pedestrian core. The shuttle will return people to their chosen stop closest to their residence, parking or transit location. Please reference the shuttle map below for pick up / drop off location details. For questions, please check our frequently asked questions. For additional assistance or to book a ride, call 604.822.9929.